I was watching the IndyCar Championship with my four year old son when it happened. I turned it off immediately knowing something bad had happened. A fiery fifteen car crash that looked as terrifying as anything I had ever seen. I couldn't have imagined it was this bad. I've been to the Indianapolis 500 almost every year since I was 14. I'm not a huge auto racing fan, but I definitely know more than the average sports fan and I love IndyCar racing. The first time I met Dan Wheldon was at a breakfast meeting and I had no idea what it was going to be like. Even though I was older than him and we were meeting for business purposes -- he was an early and active supporter of Simraceway, a video racing game start-up I was working with -- he was an Indy 500 champion and I felt honored to meet him. Within five minutes, it was like I had known him for years; he was busting the chops of my boss, making fun of himself and acting, generally, like the gregarious, funny person that came across in every interview I had seen. As he ate breakfast, he joked with the waiter about why a race car driver would worry about the relative healthiness -- he was eating oatmeal -- of breakfast before driving 200+ miles per hour. He was someone I instantly liked. And I think everyone else felt the same way. In the brief time that I met him, you could tell Dan was a really big kid doing what he loved. He was obsessed with talking about his two young boys and appreciation for his better half, something we held in common. My favorite moment was after qualifications, the day before the Sonoma race. He was testing out our race simulator and to be dragged out of the racing simulator to go to the corporate sponsored event. All he wanted to do was keep playing and racing. As soon as I heard the news, all I could think about was his kids losing a their fun-loving father. Everyone knows that racing is dangerous. Everyone knows that this could happen. But you never expect it and you never prepare for it. Dan knew that too. He tried everything he could to get in a car this year, and when it finally happened he experienced the highest high and, sadly, the lowest low. Please join me in a prayer for his wife and kids today. Does this mean the Devil is a Bengals Fan? Ben Roethlisberger, after living a full life, died. When he got to heaven, God was showing him around. They came to a modest little house with a faded Steelers flag in the window. "This house is yours for eternity, Ben," said God. "This is very special; not everyone gets a house up here." Ben felt special, indeed, and walked up to his house. On his way up the porch, he noticed another house just around the corner. It was a 3-story mansion with a GREEN & GOLD sidewalk, a 50-foot tall flagpole with an enormous PACKERS flag, and in every window, a CHEESEHEAD. Ben looked at God and said "God, I'm not trying to be ungrateful, but I have a question. I was an all-pro QB, I hold many NFL records, and I even won a few Super Bowls." God said "So what's your point, Ben?" "Well, why does Aaron Rodgers get a better house than I do ?" God chuckled, and said: "Ben, that's not Aaron's house. It's my house." For many people, the biggest barrier to canceling cable is the loss of live sports. While MLB.com has a package of games you can stream online, and CBS has offered a popular March Madness on Demand stream, many other leagues have been slow on the uptake. Plus, there are often restrictions and blackouts with some online season pass deals. For example, the NBA League Pass Broadband does not include nationally or locally televised games. So if you're living in Boston, you won't be able to see Celtics games online if they are also on TV at the same time (whether they are home or away). I lived without a TV for about 9 years. It was really pretty easy. I've had cable for about 3 years and the only reason I got was because I was having a child and I wanted some brain-deadening sports when up late at night. It's worked. I'm now braindead. I'm deciding now whether to cut the cable cord and the only thing I think the only thing I'll miss is random basketball and baseball games. Cuban left-handed pitcher Aroldis Chapman, whose defection sparked a bidding war among major league teams that coveted his 100-mph fastball, agreed Sunday morning to sign for $30 million with the Cincinnati Reds, sources close the negotiations told Yahoo! Sports. Have I mentioned the Bengals lost? Oh well, on to spring training thoughts. A MAN GOES TO A PITTSBURGH STEELER TICKET OFFICE AND ASKS ABOUT PURCHASING PLAY OFF TICKETS. THE TICKET TELLER REPLIES THAT THERE ARE NOT ANY PLAY OFF TICKETS BECAUSE THE STEELERS DID NOT MAKE THE PLAY OFFS. THIS MAN GOES BACK TO THE PITTSBURGH TICKET OFFICE EVERYDAY FOR A WEEK. THE TICKET TELLER TELLS HIM THE SAME THING EVERYDAY. BUT ON THE LAST DAY THE TICKET TELLER LOSES IT. IN A LOUD VOICE THE TICKET TELLER YELLS,"I'VE TOLD YOU FOR THE LAST WEEK THERE ARE NOT ANY TICKETS AVAILABLE BECAUSE THE STEELERS DID NOT MAKE THE PLAY-OFFS." THE MAN REPLIED, "I KNOW. I DRIVE ALL THE WAY FROM CINCINNATI JUST TO HEAR YOU SAY THAT!" An old joke, but a good one. This year promises to be both the same and different. We're surprisingly in the playoffs, but have sorta limped into the first round. What quarter will Carson Palmer be injured? A. First, and probably on the first drive. B. Second, on a dumb play before the end of the half. C. Third, on a freak special teams play while he's on the sideline. E. Unscathed! Bengals run the ball on every play! A. 100% of the time. B. 90% of the time. C. 75% of the time. D. 10% of the time. E. The Bengals will not try and balance the attack. What Bengal will be arrested the night before the game? E. Larry Johnson - yes, we signed him. A. No one remembers the Freeman McNeil beat down of the Bengals in 1982. B. They will always be the #2 football team in their own town. C. If the Bengals win, Bengals fans won't be Bengals fans. E. Everyone hates J-E-T-S fans and they need something to talk about. A. McGruff the Crime Dog. B. Who Dey the Whodey. C. Tigger, the Siberian Tiger. *It's often difficult to tell the difference between the two. If you're hanging out in a Skyline Chili or in the Montgomery Inn right now, you already know all about Barry Larkin. US Presswire Barry Larkin had a career .295 batting average and also had a career .371 on-base percentage in 19 years in the majors. 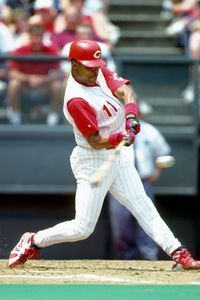 Barry Larkin is one of the greatest shortstops who ever lived. Period. Barry Larkin is a Hall of Famer. An easy Hall of Famer. Fingers crossed. Barry is a Hall of Famer, now I just hope other people realize it. He was a phenomenally well-rounded player who redefined the position. I'm now riding at least one day a week to work and I'm totally hooked. As soon as we figure out childcare drop offs, I'll increase to three days a week.